This was said at the end of Autumn and the situation has worsened considerably since then. Australia’s economy is often said to have ridden on a sheep’s back. That was a bygone era! Australia has always been plagued with drought, perhaps not as severe as we are currently experiencing. We thought that we would build resilience into AgEtal by fostering business across all states on the assumption that drought never affects the whole continent. That isn’t quite the case this year with most of the eastern side of Australia under severe drought. Perhaps climate change is having a powerful impact? Droughts are often back-to-back. That’s not new. What has changed? It is easy to see efficiency gains in farming as not benefiting the farmer. For example, it seems that the increased national yield that has resulted from breeding has delivered lower prices to the farm. The middle man takes the cream. Nevertheless, the individual farmer cannot ignore technology advance, or he will certainly fall behind. This is at his cost. Changes to farm enterprises usually come at great cost, be it for the installation of irrigation equipment, new machinery or establishment of a new perennial crop. The farmer also must learn the pitfalls of producing something that he is not familiar with. I was always taught that it is wise to have one more enterprise than the number of risk factors that you face, and those enterprises should combine to mitigate your risk. If for example, drought is your only risk factor (it never is) then you need two enterprises. One must be resilient in the face of drought and the other should maximise rewards in a normal season. That said, drought is not a new risk factor and should be considered as part of normal enterprise planning. Increasing the area of production is not sustainable in the long term and generally has the same effect as increasing efficiency – prices come down as national production increases because the middle man reaps the rewards. Increasing production area also increases risk. At some point drought will still occur. If you can’t pick up the pieces after a bad season on a small patch, your ability to do so on a much bigger patch will be greatly diminished. So, what can we do? Get back to the basics! Make sure that the small things are done well. Try to build resilience into your farming systems. Reduce your farming footprint to what can be managed sustainably. If you have a livestock enterprise, destock early if drought threatens, even if it means accepting a lower than ideal price. Limit your cropping to what you can do properly. Don’t take short cuts. Plan properly. Make sure that you have all your land prep, and farm chemicals in place when you need them. Don’t take chances with risky quality seed. Livestock production in times of drought is treacherous. Australia is a drought prone continent. Drought should be expected. Planning of animal stocking rates should be based on the certainty of drought and not the anticipation of a good season. Carrying capacity is not static and “capacity” is just that – the maximum number of animals that can be carried by a piece of land. Example: If in year 1 a parcel of land has had exceptional rain and has achieved its maximum fodder production and therefore maximum carrying capacity. Stock conservatively, expecting the following season to be a certain drought. You therefore should stock so that the grass you have will suffice for 2 years. Reassess periodically before the start of the next rainy season and destock if necessary, each time ensuring that you still have sufficient fodder for your remaining stock for at least 2 more years. If you do this you won’t make the bounties that the best years offer, but you will be much more resilient in the dry years. You will also have the best chance of retaining your valuable breeding stock when times are tough. If you were to have consecutive good years, a portion of your excess forage could be taken off to a fodder bank as hay or silage to build resilience for those inevitable drought years. Consideration should be given to building centralised common facilities where breeding stock can be maintained during our worst drought years. In such times you ship your breeders to the facility, which would be staffed by producers on a rotational basis. This would also serve the purpose of minimising the anguish of watching your stock wither as your grass is depleted. I think that roos are a much bigger problem than most people appreciate. I have watched footage of baron paddocks with cattle that are skin and bone competing for remaining forage with mobs of roos too numerous to count. It is common knowledge that proliferation of roos has coincided with freely available drinking water provided for livestock. I’m sure that there would be engineering solutions that minimise the access to roos but still allowing access to cattle or sheep? There is momentum to introduce a temporary levy of 10c per litre for milk to help alleviate the drought. Personally, I am against this. I think that the big supermarkets should be paying a fair price for all their agricultural produce including milk. They have got away with paying sub-economic prices for years! 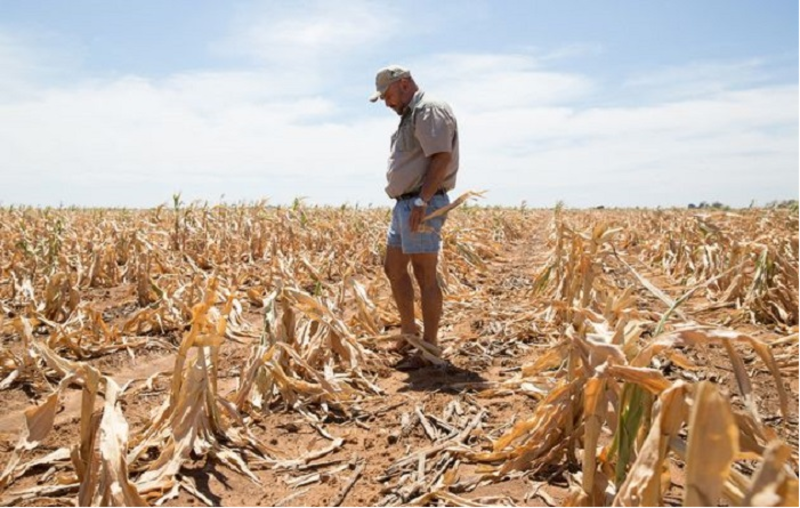 If a levy were to be imposed, would it even be possible to lift once the drought ended? I don’t believe so. Normal production cycles mean that there will always be fluctuations in demand and supply. That should be enough to determine the floor price for milk and other goods. Considering cropping! What can we do? Long term weather forecasting is improving. Unfortunately, it will never be able to predict exactly what weather will play out on your farm. All too often, and particularly in drought years, rain is patchy. If you strike it lucky and your farm is under a storm it could mean a bumper season when your neighbours are doing it tough. Normally it happens the other way and you watch nearby showers that just leave you despairing. The safest strategy is to assume drought and tailor your operations for drought when long term forecasts indicate it. It is important to contain your cropping to just what you can reasonably manage without borrowing heavily. Restrict planting to your most reliable land and do it well. Fallowed land will usually have more retained moisture than cropped land. That may be important to ensure a confident start. Select more drought tolerant crops. One of the most effective strategies is to ensure that you use the very best quality seed that you can get. Good quality, vigorous seed has a much better chance of coming through the soil when conditions are poorly. It certainly helps to have a well-prepared seed bed and to sow at the right depth – deeper than normal if you don’t have the moisture. Be particularly careful with herbicides and fertiliser placement. Chemicals can damage emerging seedlings. That is something that you want to minimise in a drought year. It is also important to be aware of herbicide carryover when planning the next crop. Anytime and especially in a drought year, the effects of carryover herbicide can be catastrophic. Plant at the right time for the crop and variety that you have. If the planting window passes and you haven’t got your crop in the ground it is better to abandon the planting than to risk it later. If you have access to irrigation water, be judicious in the use of that water. It is so precious Your neighbours would dearly love to get their hands on it, so don’t waste. Maximise the return for that water by using it to produce the highest value crops that you can. Finally, drought is insidious. It is not like most other disasters that leave their mark quickly. Drought chews away slowly like a frog in a warming pond. Above all else, you need personal resilience to cope. Be aware of the toll that it is taking on you. Talk to anyone that may be able to help and be happy to accept their help! AgEtal is an independent agricultural research and testing laboratory that specialises in testing seed and grain. Would you prefer to Print or Download this form? If you would prefer not to complete this form online, you can download or print the form. Simply complete the form on paper, attach to your sample and post or deliver to AgEtal. Testing your seed and grain is essential for the success of your crops. We offer an Accredited Objective Seed Sampling course. Simply book online for all your seed and grain testing then drop off or post the sample to our lab. Test results have a fast turnaround and are available online. Request for your samples to be analysed in three easy steps. Attach the form to your sample. Post or deliver the sample to AgEtal. We have received your request for analysis, don't forget to print and sign the receipt below to attach to your samples. Send or deliver your samples to our laboratory. If you have any questions, please contact us. We will be in contact with you when your results are ready. If you do not have a customer code, please complete the details below. Please remember to complete the final steps when you submit this form. Get in contact with our laboratory to book an analysis or learn more about our testing. Counting is done every day – after hours drop off box available. Need some more information about the laboratory services we provide or want to discuss an idea with us?